The winners of the Far North Coast Group of Show Societies Junior Showgirl 2019 were announced at a luncheon held at the Maclean Services Club on Saturday. 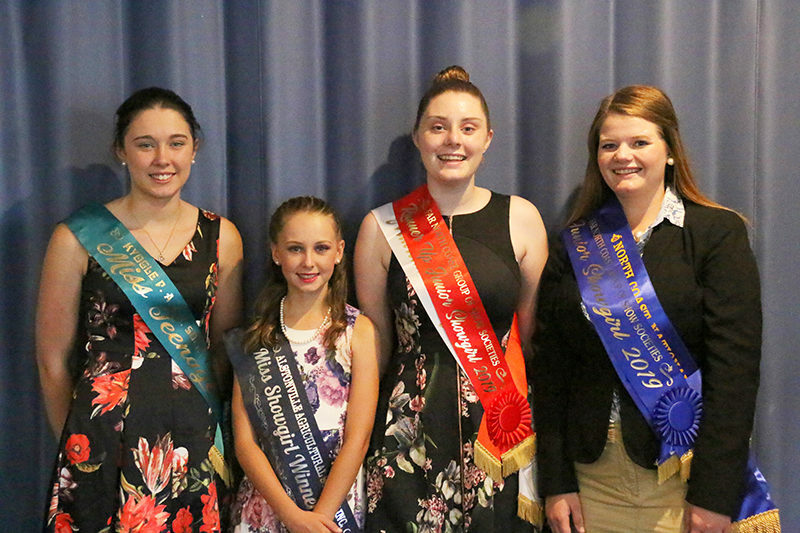 Four young ladies from Kyogle, Alstonville, Lismore and Maclean represented their area for the 2019 Junior Showgirl title. Unfortunately Grafton’s Junior Showgirl Siobhan Hoy was unable to attend the junior final judging, due to unforeseen circumstances, at the last minute. Junior Showgirl 2019 winner Nellie Witt of Lismore said that it was really overwhelming to have been selected as this year’s winner. “It’s been exciting to have met a new group of girls (during the Junior Showgirl event),” Nellie said. “I’m honoured to be able to represent the Far North Coast,” she said. Junior Showgirl 2019 runner-up Colbie Cameron of Maclean said that she didn’t expect to get a place and was shocked to be announced as this year’s runner-up. “It’s been a really good experience and I’m glad that I entered,” said Colbie. “I’d definitely like to encourage other girls to enter (the Junior Showgirl competition),” she said. Judges for the 2019 Junior Showgirl were Chris Gulaptis MP, Laurie Brown and Alice Magner (president of Generation Ag). Other special guests attending the luncheon were director of the Agricultural Societies Council of NSW (ASC) Sue Serone and her husband Terry and Maclean Show Society life member Joyce Watson, who has been attending the show since 1930 and hasn’t missed a show for the last 89 years. Former Maclean Junior Showgirl, zone finalist winners Georgia Everson and Nicole Cowling also attended the luncheon, which was MC’d by Vicki Gulaptis.